Night Ranger. Many images and songs surface to memory when you mention this band who have sold 16 million albums worldwide. What doesn't arise are memories of studio work after 1998's Seven album. Until now. Despite a changing line-up during the last decade, the group played a lot of tour dates and even released several live discs and hits collections. In 2007, the band regrouped to record Hole In The Sun. 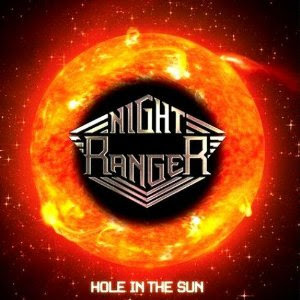 Many of the songs will have you checking credits and possibly searching to see if there is a new group that stole the Night Ranger name out there. There isn't. (To help guide the lost, they've even provided stunning acoustic versions of their classics "Don't Tell Me You Love Me" and "Sister Christian" as bonus tracks.) The band have matured. The powerful alcoholic prayer that is "White Knuckle Ride" is an outstanding rock track with a stellar breakdown that engages near the 3 minute mark. Rock tracks abound on this collection. The opener, "Tell Your Vision," blazes to life and harmonizes at just the right moments (eerily sounding like Blue October.) "Drama Queen" is a guitar work-out. The first single, "You're Gonna Hear From Me," is a song that you get the overwhelming urge to chant along. (Reminiscent of "Rock N' Roll Part 2" so I can expect it to be played at sporting events.) I never would have expected a song by the group to open like "Whatever Happened" but it is a clever chorus merged with minimalist Everclear-ish verses. "There Is Life" is a beautiful piano-based triumph. "Rockstar," "Hole In The Sun" and "Revelation 4AM" aren't slackers as they keep up what is a strong rock disc. Even the mellower "Fool In Me" seems to be placed appropriately as a break between some to the heavier tunes. Guitarist Jeff Watson and the group parted ways after recording the album but his influence isn't entirely gone as the relationship reflection of "Being" and the ZZ Top-esque "Wrap It Up," written by him, close the new tracks the disc. This album is bursting with energy... solar energy composed of group synergy. Topically and rhythmically varied, it is hard to predict what is coming next. There isn't a single let down here. Night Ranger's sound here doesn't rely on old or tried tricks and makes it positively refreshing. Despite it getting released in Japan late last year, a few goodies (the bonus tracks) were placed on here to more than make up for it. I don't see a single hole in this album and I forecast that this sun truly shines on American shores.